Path of Self Love, 9780692901816, 88pp. Based on the internationally acclaimed Path of Self Love School with over 35,000 students on 6 continents. Experience the power of "Heart Art" - using image, color, mantras and inquiries that heal and free your heart to express yourself, empower yourself, trust yourself, be compassionate with yourself, and make loving choices for yourself. 22 illustrations + inquiries based on the 11 types of self-love that together create a strong foundation of inner confidence, compassion and courage - for adults and teens. Each set of illustrations was created intentionally to invoke a specific kind of self-love, and includes a set of "heart and soul" inquiries to journal with: Self-Care, Self-Compassion, Self-Empowerment, Self-Acceptance, Self-Empowerment, & More. 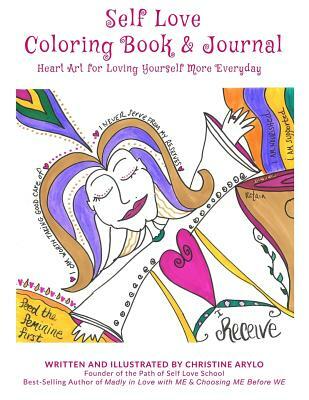 Use this self-love journal and coloring book like medicine and for your heart and soul: - Choose a specific type of self-love and proactively strengthen it. - Give yourself a "love boost" on the days you are feeling down. - Use the inquiries to connect and communicate with your deeper wisdom and truth. - Add personalized words and images to make the heart art even more your own. Self-Love is a practice, a choice and a path that is practical, powerful and fun. "Christine Arylo takes the illusive task of learning to love yourself and turns into a concrete, how-to, doable path that anyone can master.